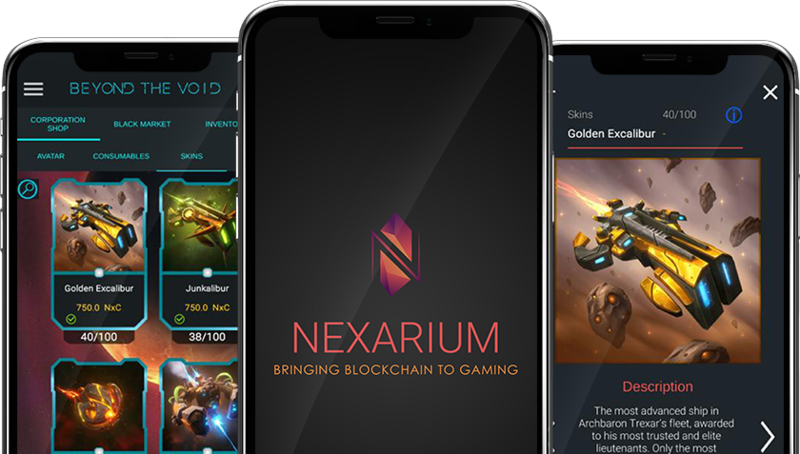 Nexarium Dapp (Decentralized Application) is a companion app designed for players having fun collecting, buying, selling and trading game items with fellow players. Gamers already collect and sell game items, however, the paid or earned assets remain the property of the game company/platform. We believe the blockchain technology will give back the true ownership of the game assets to the payers. Nexarium Dapp is a platform where players will own a wallet used to make transactions, all written on the ethereum blockchain. After 8 months of development, we are pleased to announce the release of Nexarium Dapp, a platform designed to support and enable the trading of game assets on the Ethereum blockchain. At B2Expand, since the beginning in late 2016 (light years ago in the blockchain spacetime continuum), we have been absolute and true believers that blockchain technology will be a huge game changer (no pun intended), a game changer the likes of which we don’t see often in a life-time. Blockchain technology has a lot to offer and especially so in the video game industry. The video game industry will be the sector to trigger mass adoption of the blockchain use case. We designed Nexarium in that spirit and, all along, UX has been of the utmost importance. Our blockchain team has successfully created Nexarium Dapp (a decentralized app featuring a shop and a marketplace), the companion App of Beyond the Void. We originally intended to extend the platform to other developers and enrich the catalogue. By using the Nexarium Dapp built-in wallet, players can claim the true ownership of their game items on the blockchain, in a completely decentralized approach. At this early stage, larger companies in the space have been working on creating cross-gaming platforms. The main goal is to overcome the high level of friction users face by offering the best UX available given the current limits of the technology). Bringing content (game assets from as many IPs possible), attracting developers is one of the principle current goals. It’s never been more true that: “ If distribution is king, content is queen… and she wears the pants”. At B2Expand, we are pleased with the UX and the functionality of the Nexarium Dapp. We were absolutely convinced we could offer our players a fully functional corporate shop and a marketplace on the blockchain. The team is proud of Nexarium Dapp for which a lab was created, a place to challenge ourselves, learn and experiment. Nexarium Dapp features Beyond the Void game items (+ items from 2 more games to come from our studio) such as cosmetic skins for ships, avatars and consumable items. Legendary skins will be published in limited quantity. Those items are published in the Corporation Shop inside the app. They exist outside of the game, so players can keep all their winnings, skins and any other cosmetic items forever, even if they jump from one game to another. It’s their universe as much as it’s ours! We empower players by offering them to become the true owner of their game items, meaning that they are the ones who will decide to keep them safe, sell or transfer them. Gamers can store their game items safely in their wallet, created directly in the store, as they are used to. But, now they are the only ones who know their wallet information. No one can take out an item from their wallet, except themselves. Gamers already enjoy selling and transferring game items. Enabling player to player trading of game items will enhance the video game experience for all the game lovers – gamers and developers. We have paid special attention by making this peer-to-peer marketplace as frictionless possible in terms of UX/UI. Gamers can sell their items and discover the rarest items such as backer ran cards and limited edition items such as avatar and skins sold only by the Captains themselves. It’s the perfect place to find a buyer for a rare collectable spaceship. For the newest items available in the Nexarium galaxy, gamers will go check the Corporation shop. Your Nexarium account will be used to connect to all Nexarium games and apps, including Beyond the Void, the Store, and other games from B2Expand. Nexium is the token used inside the Nexarium dapp and minted within the Ethereum Blockchain. Nexiums can’t be mined but are purchasable on exchange platforms. Buy game items using Nexium tokens (NxC), they can be redeemed on the following exchange platforms: Bittrex, HitBTC and Openledger, Etherdelta. We are fully KYC compliant.